Project: Design update for a self guided art studio tour brochure. LGE also designed the collateral website. Description: To amortize costs, the project was expanded to cover two art tours in neighboring regions happening on different weekends: AMR Open Studios and MURAL. The website was expanded. Through special redesign, the brochure had the AMR tour was on one side and the MURAL tour was on the other. 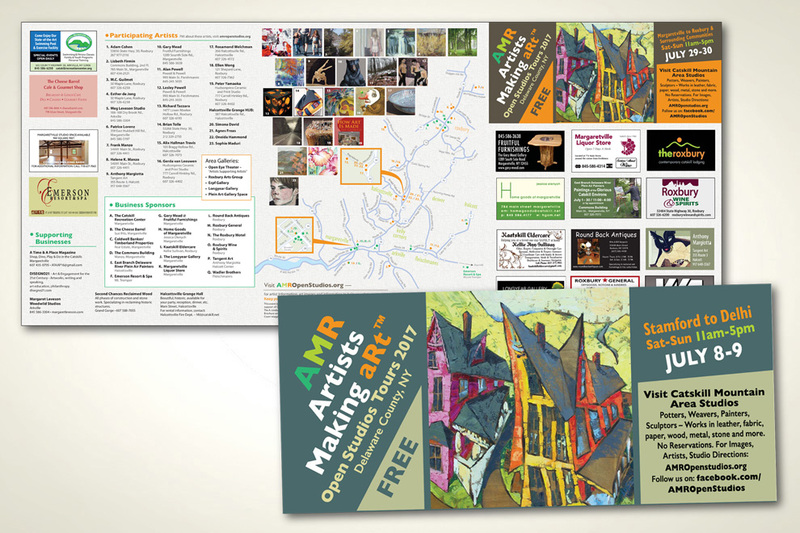 When the brochure was inserted in a rack card, the brochure’s dual accordion fold let AMR appear as the cover on one side and MURAL appear as the cover on the other side. When open, the AMR tour was on one side and the MURAL was on the other side without any panel elements appearing upside down. This allowed the brochure to also serve as a poster in each region. The brochure included two map illustrations created by LGE.